The first thing you will perhaps ask is... how is the food? This is Cuba! Many of you may have heard that the food is not up to standards and what they serve is not something to remember. If you have not been to Havana, you may have a wrong impression of food in Cuba. Cuban food is tasty. Arroz Fritos, Pork Burgers, Thick Ham and Cheese Bocaditos.. and many more. The resort however fails to impress the guests with the flavours of the real Cuba. Aside from this lackluster feature of most all inclusive resorts in Cuba... you will see and feel the warmth of the Cuban people. The concierge, the chamber maid, the waiter, the waitress, the reception, the bartender... all of them strive to make your stay memorable. You have to remember that the average Cuban makes 20 CUCs a month and it is not enough to survive. People who work here survive on tips. 1 CUC is plenty and they will feel a deep gratitude. When you are in Cuba, bring clothes, toys (snorkels), shampoo, other toiletries for men and women that you will offload during and after your trip. A bottle of shampoo costs around 7 CUC or more... what to us foreigners is a basic necessity is a luxury to the Cubans. The beach is pristine, not crowded, and the beach hut serves you food and alcohol non-stop. Maybe a few more CUCs would get you a special treatment... :-) Names like Yake, Dasiel, Dayron, Robinson, Julio... and many more offers their heart because this is their life. Appreciate Cuba! Love the people! Location of the hotel is perfect, close to the (beautiful) beach. Swimingpools are nice. Englisch is 'spoken', but not by everybody from the staff. Rooms are clean. The buffet is oké, a lot of choice. Freshly made dinners do take some time. Where to find Cayo Santa Maria hotels near an airport? 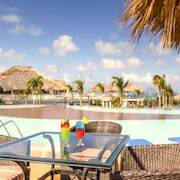 Where can I find hotels in Cayo Santa Maria that are near tourist attractions? 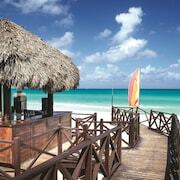 Expedia.ca offers a selection of 19 hotels in Cayo Santa Maria. You are sure to find cheap deals and discount rates among them with our Best Price Guarantee. No matter what type of hotel strikes your fancy, we will let you search for your preferred one to accommodate your travel needs. Expedia.ca will not only save you time, but also money when booking your stay at a hotel in Cayo Santa Maria. Making reservations so you can stay within your budget is easy with us. Expedia.ca even provides you with a map so you may find hotels in the Cayo Santa Maria neighborhood you prefer. Go ahead. Enter your travel dates to view the best offers on hotel rooms in Cayo Santa Maria, Villa Clara now! Are there hotels in other cities near Cayo Santa Maria? Explore Cayo Santa Maria with Expedia.ca’s Travel Guides to find the best flights, cars, holiday packages and more!